We’ve had a rough couple of weeks here at the Rowhouse. Everything is in transition. You know how transitions are. Plus we’ve been sick. Is there anything worse than a spring cold? Plus, we’ve been getting ready for the Folger Children’s Shakespeare Festival, which is today. I hope the kids are able to show off their hard work. And directly after the festival, the most epic thing of all… we’re headed to Global Finals for Destination Imagination. As you can imagine, we’ve been antsy and excited. We have gotten a little school done amidst all that, but writing assignments for Mushroom got suspended as he very single-mindedly decided he absolutely had to make a comic to share with his teammates at Global Finals. There will be one issue every day with a total of four issues. They’re all short, but clearly drawn and very adorable, about an imaginary Destination Imagination team that is also going to Globals. They have some small adventures and in the last issue, they happen to meet our entire team and trade pins with them. Mushroom often dreams up big projects like this, but he rarely brings them to completion. His anxiety really gets in his way on that very often. He will begin something and then question his ability to really accomplish it the way he wants and give it up rather than keep working. This time he was convinced he had to finish. He let me help him with his spelling. He even insisted on photocopying, collating, and stapling them himself. I’m so glad that he stuck with this project completely on his own with very little help or prompting on my part. He advocated for wanting to work on his own project during all our writing time and I was happy to agree. One of the things we’ve been aiming for this year has been more kid-driven learning. Up to this point, the kids haven’t really wanted to drive their own learning as much. Even when they’ve had their own projects, they’ve wanted school to stay school. Slowly though, they’re advocating for picking more of their own work, which is exciting to me. 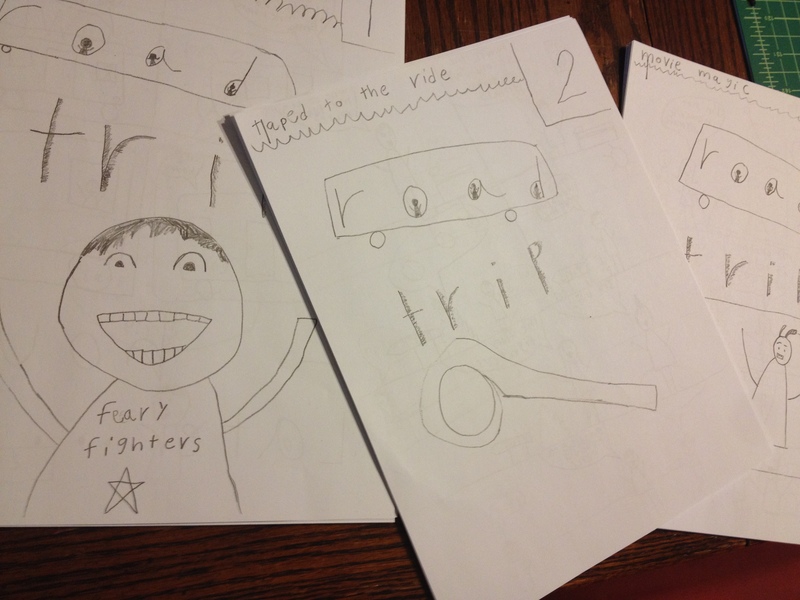 I do want to get back to some of the things we had originally intended to do in the last week, but this is much more exciting – a writing and art project he dreamed up himself, carried out without help, accepted some help editing in the last stage, and now has published himself to give out to friends. So we’re off to Globals! Wish us luck and here’s hoping that Mushroom’s comic series is well received. save a copy of the comic for me…and good luck! No. What you want to start a team is a team number pack. They’re $95 (though there can be other fees from your affiliate). They’re not available until the season begins – usually they begin selling the current season challenges on September 1st. You can see the challenge previews already though – just a teaser for what the challenge options will be. Also check to make sure that where you live has an active affiliate- a couple of states don’t have an affiliate and if you’re outside the U.S. some places have them (most Canadian provinces do) and others don’t or have tiny affiliates (the England one only sends a couple of teams to Globals). The affiliates also have websites usually and the organization there is a good way to get support – contact them. They hold team manager trainings in the fall and should be able to talk you through starting a team.